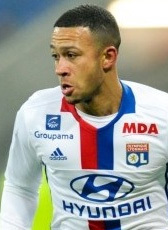 Memphis Depay moved to Manchester United in the summer of 2015, right after becoming top scorer of the Dutch Eredivisie with 22 goals. Manchester United paid PSV a total amount of 34 ME, making Memphis the most expensive player ever sold by a Dutch team. Memphis made his debut for Manchester United in a pre-season friendly against Club America in Seattle in July 2015. During the coaching period of Dutchman Louis van Gaal, Memphis had a lot of playing opportunities. That changed during the departure of Van Gaal and his new coach Mourinho was not giving Memphis many chances again. In January 2017, a transfer was announced for the Dutch man to join French giants Olympique de Lyonnais. Transferfee was around 17ME for a contract until June 2021.